Someone I can't remember and a name tag I can't read. Last time I went home for a visit, I was in the grocery store with my mom when one of the employees waved at me and said, "Hey!" I waved back, smiled, and said "Hey!" I continued shopping with my mom and then had to back track to get something. The lady who said, "Hey!" came up to me and said, "You don't know who I am do you?" I said, "Uh... I thought you were just being friendly." I tried to do the quick dip with my eyes to focus on her name tag, but my eyes don't work like that anymore. Turns out she was a classmate of mine. She likes my status on Facebook all the time. Maybe if I was wearing eyeglasses I would have recognized her as my classmate instead of a friendly employee. It's a Finish the Sentence Friday AND sponsored post! "I hit a turning point in my life when I... realized my brain won't process what my eyes can't see." I need to wear glasses all the time. Every year I say I am going to get some new glasses. Last year I came close to buying a pair that the sales lady was adamant about how great they looked on me. Baby Bear was with me just shaking his head no. For a $200+ price tag I had to take his word for it. I left the glasses there and threw away my prescription. I've mentioned here before that I hate shopping, but I don't mind ordering stuff. I would love to order glasses. Wouldn't it be cool if you didn't have to go in a store to try on glasses? You know I love apps for that. Well this is close enough. Guess what? There's a website for that! 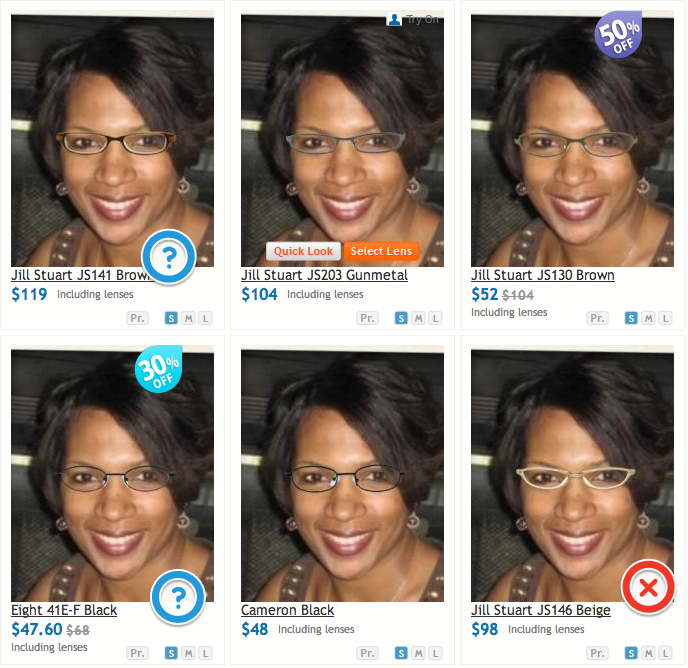 You can totally try on glasses virtually at GlassesUSA.com. There are bunches to choose from so I uploaded my social media profile picture to the website's Try on View. Look at what I came up with. Free Shipping for all US orders (no minimum purchase) and Worldwide for orders over $99. This was fun window shopping! I encourage you to go and try on some frames yourself or your family using the Virtual Mirror. It's fun! Here's the thing... I need to study Facebook and memorize faces before my 25th high school reunion in August. I also need to narrow down my search for online glasses and order a pair so that I can read the name tag of the classmates who I don't recognize.